Even though the Red Sox are riding high a few weeks into the season with the best record in Major League Baseball, another great baseball league enjoyed its 2018 Opening Day on Sunday. 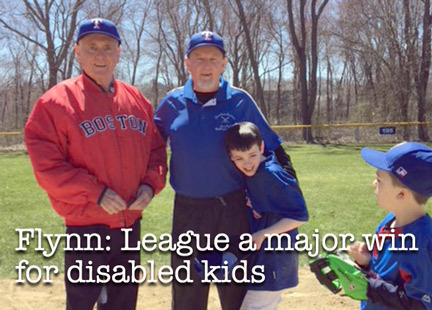 For many years, the great people of Braintree American Little League have run a Challenger Division for disabled and other special needs youth. The league is the passion of Dorchester native Joe “Okie” O’Connor, who last August was named both Massachusetts and Little League International Volunteer of the Year for his ceaseless efforts. His Fenway Park and Williamsport, Pa., ceremonies were long overdue. The league annually hosts over 100 players from more than 30 Massachusetts towns. The players­ wear MLB uniforms and play weekly games with their teammates and friends, both new and old. As a recently retired member of Teamsters Local 25, Okie and the league have connected with and benefitted from the incredible generosity of Teamsters President Sean M. O’Brien and the union leadership. Local 25 provides the vast majority of the financial support for the Challenger Division, allowing each player to play the season for free. On the night before opening day in Braintree, Teamsters Local 25 held its annual Autism Gala at the Boch Wang Center. President O’Brien and his membership have been longstanding supporters of those in our community afflicted by mental and developmental disabilities. Many dedicated Massachusetts citizens work hard to help children with autism and various neurological diseases. I see doctors, nurses and teachers helping these special needs children all the time in clinics, hospitals and schools. They are heroes, but so are the parents of these children. I want them to be reminded that we admire them, love them and will continue to pray for and help them till we discover cures to help their children get well. I believe that God and the Blessed Mother Mary in the upcoming month of May will shed light on medical research to help those heroic, beautiful children and their families. But we can’t lose hope. It will happen. The spirit of engagement with community shone through Sunday at Hollings­worth Park in Braintree, where hundreds of family members came out to cheer on their super­stars on one of the first nice weather weekends of the year. Supporting any league also requires an army of volunteers, and the Challenger Division not only has the dedication of longtime coaches like Marta Googins and Steve Reardon, but also newer faces. On Sunday, the league welcomed some students from the Massachusetts Maritime Academy, who wanted to make the experience great for everyone. The kids in the Challenger Division won’t play for our beloved Red Sox one day, but they are loving to play each week for the Rangers, Mariners or Athletics in Braintree. Stories where community engagement meets organizational financial support and the volunteer spirit are not often in the spotlight, but it would be nice if this great sports story was an ESPN “SportsCenter” highlight. Ray Flynn is the former mayor of Boston, U.S. ambassador to the Vatican and baseball coach in the Challenger Division.